I always enjoy using different modes of transportation when exploring new places. 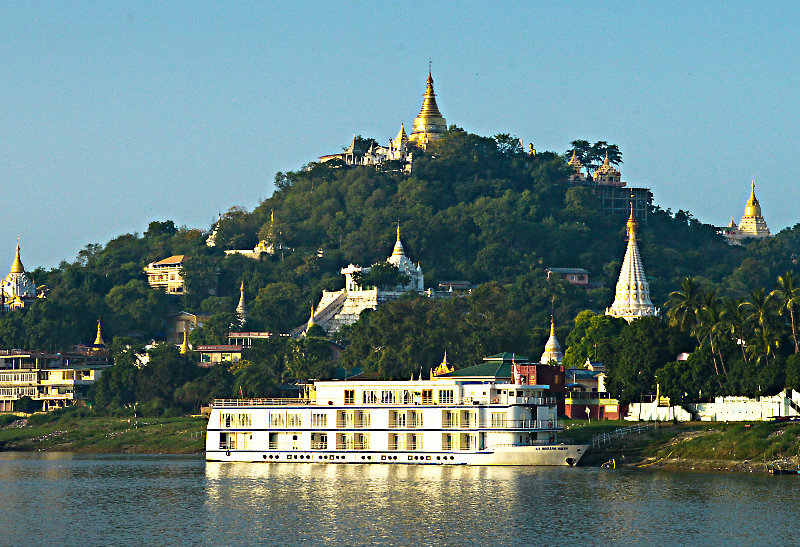 Today I was taking a riverboat, leaving Mandalay, Myanmar (Burma) and heading southward to Bagan. Most travelers make this journey by bus, but I chose to take the MGRG Boat instead. True, the bus would have been a bit cheaper ($9.00 vs. $45.00 US), but the chance to cruise down the Irrawaddy River was an opportunity I couldn’t resist. It would allow me a chance to kick back and relax a bit as I watched Burmese villages and life on the riverbank slide past. In my mind it was money well spent. It had rained during the night and the sun was not yet up as I splashed my way through the dark puddled streets of Mandalay at 6:00 AM. I arrived at the river jetty and, having purchased my ticket the previous day, I gingerly scrambled up the precariously damp and narrow wooden planks to board my boat. It’s advertised as the “MGRG Express,” but since it takes almost 10 hours to cover the 115 mile water way between Mandalay and Bagan – well, it’s a catchy name but hardly truth in advertising from my point of view. I wasn’t looking for an express ride however. I didn’t take the boat because I was in a rush. If I were in a hurry I would be riding the bus that makes the Mandalay-Bagan run in 5 hours. The crew stowed my bag and I headed out to wander and explore the boat. The lower deck was fully enclosed and comfortably appointed with airline type seating. The upper deck was open, with wicker deck chairs under an awning and stacks of plastic chairs that could be placed where you like on the uncovered rear portion of the deck. It was still dark and chilly as the boat departed at 7:00 AM so I decided to begin my cruise in the comfort and warmth of the enclosed cabin. The riverboat is fairly large and I was surprised that there appeared to be only about 25 passengers making the trip. Most seats were unused both on the lower and upper decks. Later, in Bagan I talked with another traveler who had taken the same cruise on the day following my journey. It turns out I was quite fortunate as his boat was filled to the point that some passengers were unable to find seats. On this occasion it seems the travel gods had smiled upon my journey. Once underway, with the sun rising in the east, I made my way to the upper deck. It was still cool and I was glad to have a light jacket in my pack. I grabbed a deck chair, sat back and watched the sun rise over the temples and fields on the banks of the Irrawaddy. Yes indeed, this was definitely much better than a dusty and bumpy Myanmar bus ride. The initial stretch of the cruise from Mandalay offers interesting views of Burma; golden Buddhist temples bathed in morning sun, small villages awakening to start the day, farmers with teams of oxen or water buffalo heading to their fields, women washing clothing in the river. 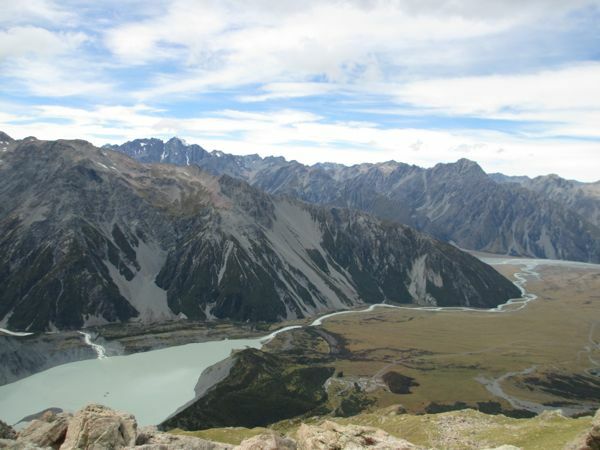 As the river flows southward it widens, passing through open agricultural land and the view becomes a bit more routine. Not to be deterred from enjoying the cruise, I easily settled into the leisurely pace of life on the river. My demanding onboard schedule included a bit of reading, taking lots of photographs, writing in my travel journal, and taking a nap or two as well. It was a relaxing and welcome change from the busy streets and venues of Yangon and Mandalay -very pleasant indeed. 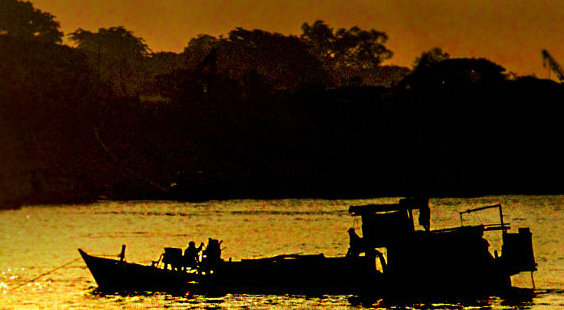 The Irrawaddy is a working river. Looking out over the rail I saw large “barges” comprised of teak timbers tied together and being floated downriver, as working craft, large and small slowly plied the waters. Some carried food, others held cargo containers and some were laden with heavy equipment such as land-movers and dump trucks to the point that the boat decks almost touched the waterline. The Irrawaddy tends to be rather shallow. The navigable channel shifts and narrows frequently, at times necessitating my boat to pull briefly to the bank to allow upstream traffic to clear. While technically an “express,” it also made an occasional brief stop, pulling bow first to the bank while a passenger scrabbled ashore near their village. Several times a smaller boat pulled alongside to embark or disembark passengers “on the fly” while our boat continued it’s way down stream toward Bagan. 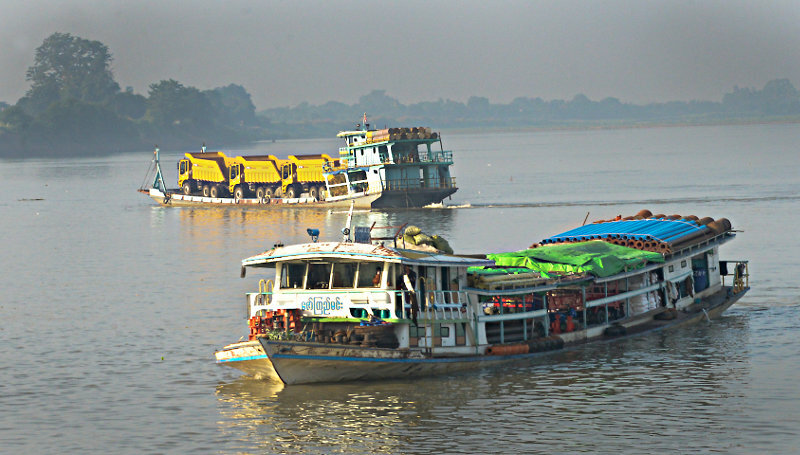 Such is the casual and easy-going pace of life on the Irrawaddy. I arrived in Bagan as the sun was setting. My foot had barely touched the beach when I was surrounded by a gaggle of Burmese, each gesturing and loudly offering to take me to my hotel with various modes of transport including car, horse cart, tuk tuk or motor scooter. My peaceful journey from Mandalay was obviously over. I’m always eager to try different forms of transportation however, so with a smile on my face I walked with my driver to his horse cart, ready to start my next adventure in Myanmar.